Pretty self explanatory when you think about it a bit. Although she did get a couple comments suggesting that she was being insensitive to transgender folks. Skins are really getting thin these days. That got me to thinking about the numerous relationships we experience in the lean manufacturing world. The quality of consultants vs. long-term results, outsourcing and lean, layoffs and respect for people, knowledge and experience vs. hourly cost. An effective lean transformation is a complex equation. 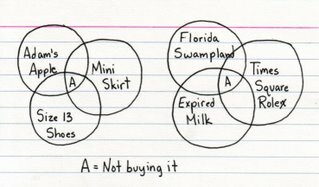 So I jotted down a few Venn’s of my own. Unfortunately my scanner is on its last legs therefore my graphics don’t hold a candle to Jessica’s. We all know of consultants, some good and some bad, who try to make a buck on every possible nuance and niche associated with lean. Perhaps a gold star could go to whoever is able to actually trademark one of these niches or intersections. Let’s try another. We’ve written about companies that live in some of these intersections. 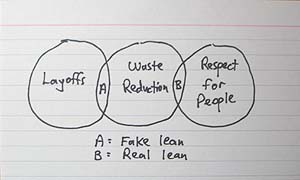 Whirlpool lives in "B" with their supposed lean activities coinciding with massive layoffs. NCR lives in "A" by claiming they’re working on lean while closing as many factories as they can in order to outsource to Solectron. Most of the outsourcing lemmings live in "D" by not even bothering to try lean. 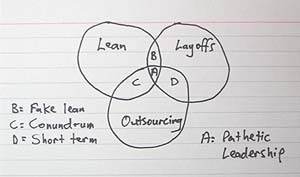 And, similar to my first index card, there are a few consultants (I’ll refrain from calling them quacks… barely) who somehow believe lean and outsourcing can be combined into a positive competency and live in the "C" world. Ok, one more. Here’s a way to describe a whole host of companies. Probably 95% exist in "A", such as Global Engineering, that give lean a bad name by whacking "excess" people as soon as a lean program frees up some time. Ford and GM could also be included, although in some cases they pay to entice knowledge and experience to leave. A couple companies, obviously including Toyota, exist in "B." It would be easy to build on some of these to create relationships between real lean, fake lean, and results. Or perhaps between the "kaizen-in-a-box" consultants, long-term consultants, and the effectiveness of a lean transformation. In any case, take a few lunchtime minutes a browse around Indexed. You might see some new patterns to everyday life. What a fantastic post! I love your simple approach using the “forgotten” Venn Diagram to visualize these relationships. Thanks for sharing your inspired thoughts! What a superb post. 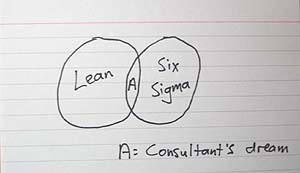 I had to chuckle on the Lean + Six Sigma = Consultants dream since I chose that combination for the name of my blog. Suffice to say I am not a consultant so am blameless as far as that goes! My motto in life is to learn something new everyday and your post helped me accomplish this goal today. Well done!